Blue Flax (Linum lewisii) Perennial; Pretty border plant with blue flowers. Flax seeds are used to make linseed oil and are used to treat diarrhea, coughs, and rheumatic complaints. Full sun; plant height: 24in. 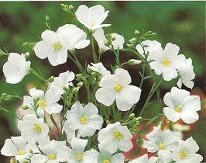 Diamond White Flax (Linum perenne nanum) Perennial; White flowers. Full summer flowering. Full sun; plant height: 10 in. Scarlet Flax (Linum rubrum) Annuall; This wildflower, originally found in Europe and North Africa, has aclimated itself to most of the United States. It is the perfect survivor, tolerating extreme heat and drought. Very pretty in mass plantings or in wildflower areas. Full sun; plant height: 1-2ft. Yellow Flax (Linum flavum) Perennial; Large yellow flowers. Good rock garden plant. Drought tolerant. Attracts butterflies. Full sun; plant height: 6in.